I have always loved to cook, but sometimes finding the time to cook all of those spectacular recipes you see on Pinterest just does not happen around here when you have a crying baby that just wants mommy cuddles all day. I told my husband when I became a stay at home mom one thing I wanted to work on was cooking more meals, ones that we do not eat on a regular basics. I mean I only have what seems like a thousand food pins on Pinterest and maybe twenty-five of them being completed! So I told myself now is the time to prepare nice meals since I have all day at home. This week I do not have my week entirely planned out as my grandma is coming to visit us for the week, but I do have a few dishes I plan to cook for her. Listed are links I plan to try. I have had these recipes pinned to my Pinterest for a while now. I will let you know how they turn out! 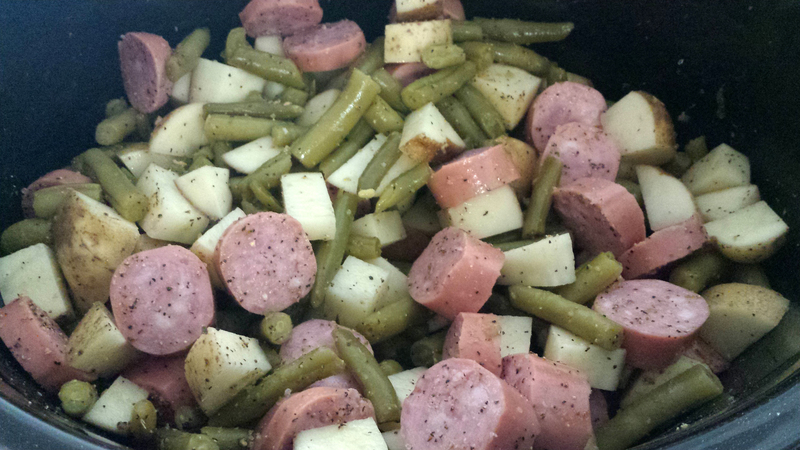 Tonight I made smoked sausage, potatoes and green beans in the crockpot! They were delicious…ask my husband, he had two big helpings! Here are the meals I cooked last week! I was so proud of myself for cooking all five days of the week. Two of the five meals were made in the crockpot; which I plan to make better use of! This meal can be adjusted for the size of your family and any leftovers can be put in freezer bags for future use! Recipe: I put our two slices of meat in the crock pot on high and seasoned them with some of our favorite seasonings. After a few hours of cooking I took both pieces out and shredded them with a fork and placed them back in the crockpot. I added enough BBQ sauce to cover the meat. Stir it well and turn the pot to low. If you cook on high and forget about it some of the BBQ sauce may burn to the pot. For the cole slaw I got a bag of Dole Classic Cole Slaw from the store and made my own dressing. Mix miracle whip, milk, vinegar and sugar with the bag of slaw and refrigerate. I like my slaw on the side, but my husbands puts his right on top of the meat! 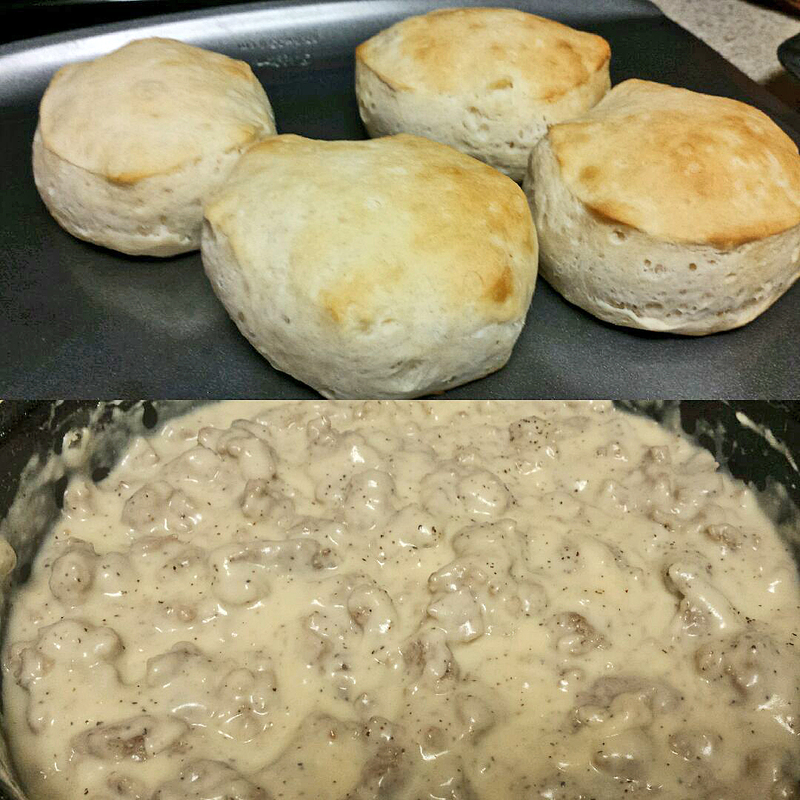 Recipe: I love biscuits and gravy and my grandma taught me how to make the best homemade gravy. It took me a while to get it right and I still struggle to make it perfect, so don’t worry if it is not perfect the first time you try it! Cook your biscuits according to the package. For the gravy cook your roll of pork sausage until brown. I like to add salt and a lot of pepper to mine! DO NOT drain any of the grease. Once it has browned add a tablespoon of flour and stir around with a fork. The flour will soak up the grease and you will notice the sausage mixture getting thicker. This is the tricky part because you have to just eye ball it and add more flour if you think it needs a little more. Once you have added flour pour in a little milk. There too is no right amount of milk to add. Pour in about 1/4 of cup and stir with your fork. You will notice the gravy thickening up. If it is too thick due to the flour add more milk. If it is too runny add a little more flour. You can keep adjusting until you get to the consistency you like. To finish pour the gravy over your biscuits! Recipe: I cooked 2 chicken breasts in the chicken broth until completely cooked. (I started with the carton of broth, but once I got all my other fixings in there I realized I needed a little more brother so I added one can and it worked out perfect.) Once the chicken was completely cooked I took both pieces out and shredded with a fork and put back in the crockpot with the brother. I cut up the celery, carrots and onions and placed them in a small mixing bowl and added salt and pepper and a few other seasonings to my taste and tossed those around until covered in the seasoning. I added the veggies to the chicken and broth then worked on my noodles. The noodles take a couple hours to dry so you can make the noodles before hand, and freeze them or make them the day of. Even if you make the day of and do not use them all you can freeze them and use for future recipes! In a mixing bowl add the eggs, salt, water and food coloring and slowly add in the flour. Stir with a fork until you get a good dough. (I always try to mix well with a fork before I get my hands in there otherwise the food coloring will be all over your hands!) Once you get into a dough knead with your hands until you have a good dough to work with and you can roll out like you would sugar cookies. A rolling pin works best along with a noodle cutter. If you do not have a noodle cutter, once you have the dough rolled out to your consistency you can use a knife and cut strips the size you like. Sprinkle a little flour down when needed to keep the dough from sticking. Once you have your slices cut let them sit out to dry for a few hours. Once dry add as much as you want to the crockpot with your other ingredients. Any leftover place in freezer bags and freeze. This one is easy! Follow the recipe on the can of sloppy joe mix! For the baked beans I love Busch’s Honey Baked Beans and I add some brown sugar and ketchup for more flavor! Enjoy with any of your favorite chips. We prefer Wavy Lays! Recipe: I cooked and drained 1 lb. of ground beef then added taco seasoning. On a plate I layered chips, then added nacho cheese (I stuck the plate in the microwave for about 15 seconds to warm the cheese), some meat and topped with some tomatoes, salsa, a few jalapeños and a dash of sour cream! They were super yummy! Do you have any recipes you would love to share? Email Pint Size Perfectionist at pintsizeperfectionist@gmail.com to see your recipes make the blog!